Happy Holidays to our Strongtown Family! For those that ordered Baseball T's they have arrived and can be picked up at the gym. With the Holiday weekend approaching we have updated our Schedule page to reflect any changes to the daily class routine. Sticking with tradition we will be completing our '12 Days of CrossFit' workout on the morning of Christmas Eve. Since this falls on a Sunday this year we are adding an additional class at 8:00am and moving the usual 10:00am class up a half hour to 9:30. We will be closed on Monday the 25th and open for a half day on the Tuesday the 26th. Kyle has never done a bar muscle-up until today's wod. The 9:30am class working for their calories. 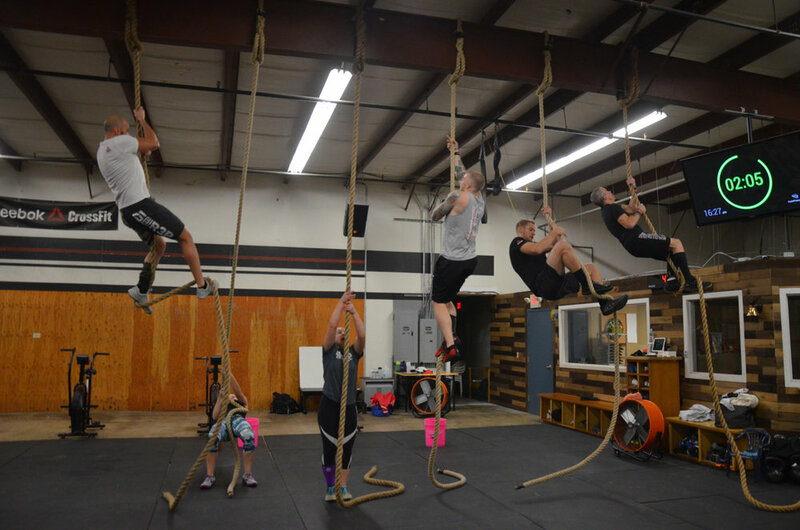 The 4pm class on their first round of rope climbs.